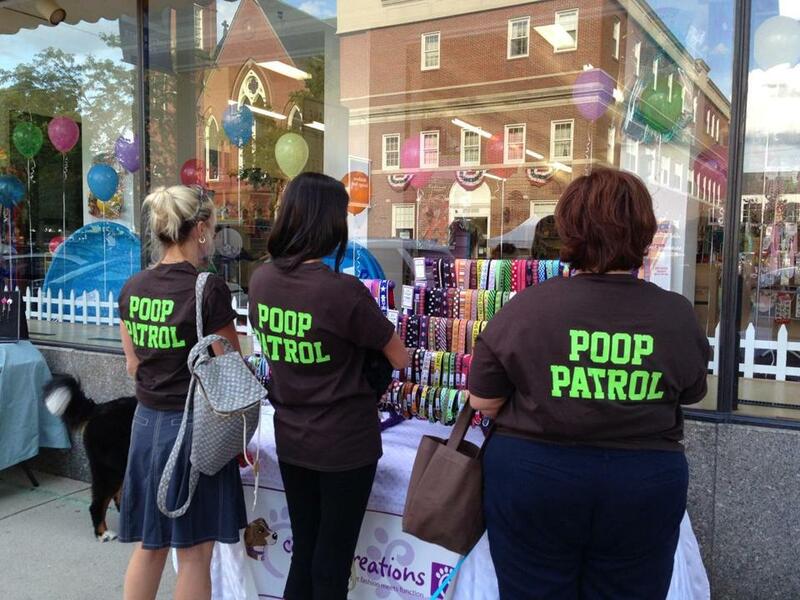 FIDO of Natick’s highly visible members include (from left) Lisa Larsen Cross, Melissa Cusson and Kelly McPherson. FIDO of Natick spent the summer cleaning up after careless dog owners who let their pets off leash on the downtown common and soccer fields around the community. An all-volunteer organization that is applying for nonprofit status, FIDO — which stands for Fun, Informed Dog Owners — was started about a year ago, and has lobbied the town for an off-leash dog park ever since. When members hand out the group’s cards around town, many folks can’t believe Natick lacks a dog park. FIDO has identified an acre of town-owned property next to the Middlesex Path on the west side of Natick for the dog park, and Town Administrator Martha White is applying for up to $240,000 in grant money from the Stanton Foundation to help build it. The New York-based foundation, begun by former CBS Television president and dog lover Frank Stanton, has helped fund dog parks in Arlington and Boston, and has awarded initial design grants for parks in seven other communities across the state. “We think Natick would be wonderful if they can provide the basic infrastructure required for providing the site and can commit water lines and other infrastructure and ongoing maintenance,” said Stanton Foundation spokesman Stephen W. Kidder . According to Bring Fido, an online travel directory (www.bringfido.com) for dog owners, three of the top 10 off-leash parks in Massachusetts are in nearby communities, with No. 3 found between Village and Cottage streets in Medway. The town’s Board of Selectmen approved the park in 2001 after a lobbying campaign by then-15-year-old Tim Dumas . Bring Fido ranks Thorndike Field, at 99 Margaret St. in Arlington, as the eighth-best dog park in the state, and Corey Hill Outlook Park, off Summit Avenue in Brookline, is 10th on its list. Other area communities hosting off-leash play areas include Framingham and Franklin, with the latest addition in Needham, which opened a dog park at 145 Pine St. on Sept. 13. In Natick, FIDO president and cofounder Kelly McPherson said the Stanton Foundation would require the town to raise 10 percent of the grant amount being requested. She noted that Needham raised $25,000 in 10 months for its new dog park. “Dogs, to a lot of people, are like their kids, so they are willing to spend like we spend on our kids,” said McPherson, who has two standard poodles, Rylee and Sophie. But first, Town Meeting members would have to allow areas of town land to be designated for use as off-leash dog parks. There is a citizens’ petition article on next month’s Town Meeting warrant seeking to amend Natick’s bylaws, which currently restrict dogs from running off leash anywhere except for the owner’s property, or with permission of the property owner. “I don’t know what’s going to happen at Town Meeting, but there are a lot of dogs in Natick. There are almost 4,000 dogs, and a lot of dog owners are on Town Meeting,” Cusson said. “Before Town Meeting, we are going to continue to meet with committees in town to address concerns people voice, and to keep people informed,” she said. The warrant article was recently supported by the town’s Finance Committee, and the Board of Selectmen also gave FIDO permission to pursue building a park on town-owned land. At some point, selectmen would be asked to expressly authorize the facility. FIDO members have spent much of the last year speaking to dog groups in towns that have successfully built off-leash parks. While McPherson said she hopes it doesn’t take years to build Natick’s first dog park, she can’t believe how far the group has come in just one year.